Artist's concept of a life-hunting "penetrator" probe that the proposed ExoLance mission would send to the Red Planet. A concept mission that would fire scientific missiles at Mars to search for signs of subsurface life is making technical strides, team members say, but it still needs quite a bit of financial help to get off the ground. 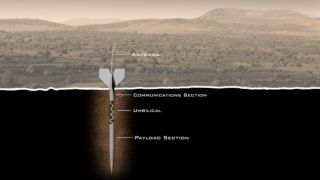 New computer modeling work suggests that the proposed ExoLance mission's arrow-like "penetrators" could indeed reach at least 3.3 feet (1 meter) beneath the Martian surface, a depth at which microbial life may be able to survive on the Red Planet, researchers said. This artist's concept shows the ExoLance concept mission at Mars, where a craft could deploy "penetrators" to hunt for signs of life in the Martian subsurface. The organization needs to raise $250,000 to make this happen, however. Explore Mars launched a 60-day crowdfunding campaign through the site Indiegogo on July 31. As of Monday (Sept. 15), the effort had raised just $15,700, with two weeks left to go. (The campaign ends on Sept. 29). ExoLance is designed to be a relatively cheap project that could travel as a secondary payload on another Mars mission, team members have said. ExoLance has recruited some respected names in planetary science circles, including NASA astrobiologist Chris McKay; Gil Levin, principal investigator of one of the life-detection experiments aboard NASA's twin Viking Mars landers in the 1970s; and Doug McCuistion, former director of NASA's Mars Exploration Program. If ExoLance manages to become a full-fledged mission, it would break new ground in the search for Mars life, team members say. "The Mars underground remains an unexplored region. The shallowness of our present missions to Mars are unfortunate because the underground of Mars is the best place to search for preserved organic remains of past life," McKay wrote on the ExoLance Indiegogo page. "Radiation and oxidation can easily destroy organics near the surface," he added. "The deeper we can go into the material, the more likely we are to find preserved organics."